The Rendlesham UFO incident in Sussex England of 26th December 1980, has become as legendary as Americas Roswell. But although there are few living witnesses to the 1947 Roswell incident there are many that are still willing to testify to what they saw at Rendlesham. They include a Air Force Colonel, other military personal, and several civilians. Strange lights and a mysterious triangular shaped metallic object were seen at close quarters, outside the perimeter of a U.S air force base housing nuclear weapons. 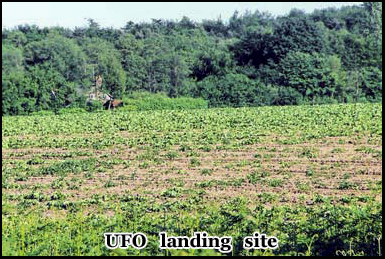 Subsequently, physical evidence of a landing site was found as the object had left indentations in the ground and exceptionally high levels of radiation. Over the space of several nights there where multiple sightings of these objects that moved at abnormally high speeds and even registered on radar. Military police were scrambled, and a team was sent to investigate. As he tracked the object through the forest, base commander Colonel Halt made a audio tape in which he dictated what he saw. For years the occurrence had been covered up, but the government was eventually forced to disclose what it knew. 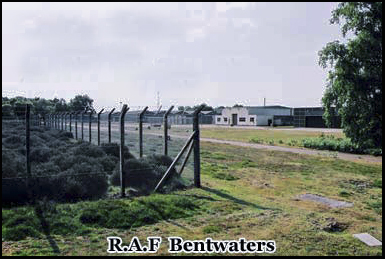 Although this sighting is widely known as the Rendlesham UFO incident, it actually took place at the R.A.F Woodbridge/Bentwaters twin air force base a few miles outside the town. 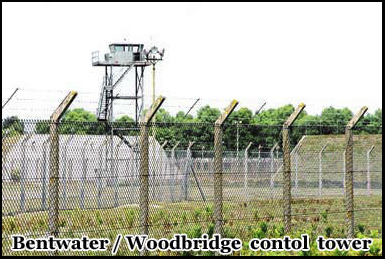 As you drive out of Rendlesham, although the base closed down several years ago, it is still signposted. The first contact you have is when you turn down a small side road. There are a few abandoned buildings, and some ex ministry of defense homes that are now inhabited by non military personal. This is also where the main gate to the base is, but it was closed, there was a security guard there and little to see. I did a u-turn and headed back up the perimeter road, and immediately on the left behind the fence I could see a series of huge concrete bunkers built into the side of an embankment. These at one point held nuclear weapons, although at the time it was denied, the government has since acknowledged this was the case. I parked the car at the side of the road, and walked closer to the fence. Beyond the bunkers you can still see the broken remains of a security gate that once guarded a now overgrown entrance. In some accounts of the UFO incident, the object was reported to have sent down a beam of light to these bunkers. Although the base is now closed there are still two high fences running all the way around it, and the area is patrolled by security guards. Although I didn’t notice any C.C.T.V cameras, it is still extremely difficult to get a close look beyond the perimeter. I got back into the car and drove a bit further up the road. At this point you have two options, depending on how much time you have. You can walk from one end of the base to the other which will take you over a hour, the other is you can drive to the other side of the base to “East Gate” which is only twenty minutes walk from the UFO landing sites. I decided to walk the length of the base, in case there was some possibility that there was a way in, although there didn’t seem to be. You have the forest on one side, and on the other side the security fence all the way along. I passed a watch tower, two runways and some massive aircraft hangers. It did look like some of the other buildings, may have been in use, but I didn’t see anyone in the area, all of which must of covered several square miles. Finally at the end of the second runway I arrived at East Gate. 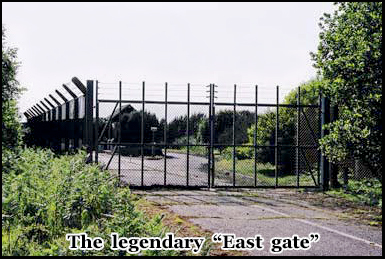 East gate is something of a landmark in regard to the Rendlesham UFO sighting as It was one of the points from which the U.S. air force personnel perused the UFO on the 26th and 27th of December 1980. One of the key witnesses, military policeman Larry Warren, wrote a book regarding his experience called “Left at East Gate”. There were over a dozen military and civilian personnel involved in the incident. Several have testified to seeing a triangular shaped craft that landed in the forest, as well as witnessing unidentified multi colored lights. Some of the other witnesses’ were Sergeant Jim Penniston who saw the craft at close quarters, even claiming to have touched it. And John Burrows, a military policeman who joined Jim Penniston on patrol in pursuit of the UFO. And although not as close to the object, produced a sketch backing up what Penniston had seen. Sergeant Adrian Bustinza also saw the object, and was ordered to confiscate the camera equipment of a civilian bystander who had taken pictures of it. Probably the key figure involved, was base commander Colonel Charles Halt. It was an official memo written by him, and the fact that he dictated his account of what he saw at the time onto an audio tape, that made him primarily responsible for making the Rendlesham UFO incident as famous and as credible as it is. His memo was to the British Ministry of Defense, and described how two of the patrolmen under him had reported “a strange glowing object in the forest”. The object was described as “being metallic in appearance and triangular in shape”. Other parts of the memo describe “3 depressions 11/2 inch deep and 7 inch in diameter”, which next day was found in the ground where the object was sighted the previous night. I was now standing directly outside East Gate. Unlike many of the places I had visited, at only twenty years the incident that occurred here, is really fairly recent if you compare it with most hauntings, legends or other famous UFO sightings such as Roswell. The fact that the base is as it was, although empty, also adds to the air of mystery. You are also very aware that it is an ongoing investigation and the men involved are still actively talking about their experience. This definitely isn’t some 300 year old ghost story about a haunted castle. There is a paved concrete track directly in front of East Gate guard post. I began my walk along it towards the intersecting road at the far end. It was easy to picture army jeeps, and utility vehicles driving along here at high speed in pursuit of the mysterious lights in the forest. As you come to the end of the track there is still a barrier blocking the way to cars. Interestingly a few yards along the road to the left there is an official sign commemorating the key events in the history of the air force base and among items referring to the cold war, and advances in aircraft technology it says, “1980 UFO incident”. There must be only a handful of signs in the entire world that say that. 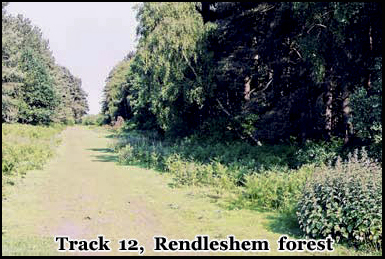 From here it is possible to follow the trail the air force personal took over the several nights of the Rendlesham UFO Incident. The fact that it did occur over more then one night specifically that, of December 27th/28th/29th also makes the incident unique, and many of the witnesses’ were present on more then one night. I am now walking along the road that intersects with East gate, making a right, and then a left to what is referred to as track twelve. At the time of the incident several civilians living locally in the area reported that the military blocked off this part of the road except to authorize vehicles. I crossed to the other side of the street and headed along what is a grass logging track. On either side of me is Rendlesham forest. Colonel halt and the other personal where able to drive about half a mile along this track until it narrowed to the point where they had to peruse the UFO on foot. I walked from the track and into the forest, parts of it are extremely dense and it feels like night time, although it is still only mid afternoon. The air force personal swarmed through this area with flashlights, after the bright multicolored lights as they moved in and out of the trees. Several of the military vehicles carried what are known as light-all’s, these are high powered self contained searchlights. It was reported that as soon as they got near the vicinity of the UFO they began to fail, and there was a massive increase in radio interference. I am now nearing the point in track twelve where there is another path that branches off to the left hand side. Somewhere around this area is where one of the landing sites was. As base commander Colonel Halt, searched the area he dictated into his tape recorder, “its coming this way, its definitely coming this way, there’s something very strange” as the lights flash through the surrounding forest. He then exclaims “here he comes from the south, he’s coming in towards us now, this is weird”. I am now in the approximate area of the landing site he referred to, but after so many years it is hard to identify and I really can’t tell exactly where it is. The track is now fairly narrow. I walked further on to the other side beyond the trees to my right, where I could see an open field. I went through the clearing by the trees and into the open. Around this area is where the craft landed the first night. As the ground slopes away on the far left there is the farmhouse that colonel Halt referred to as “glowing like its on fire” as the lights reflected upon the front of the building. Beyond the farmhouse barley visible through the trees is a distant lighthouse, and to the right of that there is a light ship somewhere of the coast several miles away. It had been suggested by some that these dozens of highly trained air force personnel mistook the beams of these as being a UFO. I have been here previously at night, and you only have to do this once to see how ridiculous this is. These were men who were permanently stationed nearby and must have seen these faint lights night after night. They were also responsible for guarding a military air force base housing nuclear weapons. But the lighthouse theory is another one of those pieces of poorly researched misinformation, that skeptics like to dream up to try and discredit what is extremely credible information. There is a vast amount of supportive evidence as to the validity of the Rendlesham UFO incident. Official questions asked in the British House of Lords regarding the incident were raised as recently as 2001. There is still strong evidence to suggest that there is much more information to be uncovered. Civilian witnesses have testified that members of the police force were involved in keeping away members of the local population at the time of the event, but no official log was kept of this. In regard to the secrecy surrounding the base, the government first denied then years later acknowledged that they had kept nuclear weapons there, so if they have admitted to denying the truth once, it is quite feasible, and likely, that they are hiding it again. 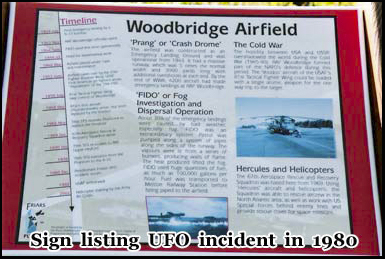 Hey Buddy!, I found this information for you: "Rendlesham UFO Incident". Here is the website link: https://www.chasingmidnight.com/rendlesham-ufo-incident. Thank you.